Jerusalem is defined by three valleys: the Kidron, Tyropean and Hinnom. In the photo below we are standing in the Tyropean Valley. Jews come here to mourn the destruction of the temple, among other reasons. This wall was not part of the temple itself, but was the retaining wall for the temple and the structures on the temple mount. Some of the courses of larger stones starting from bottom are Herodian, and weigh several tons each. 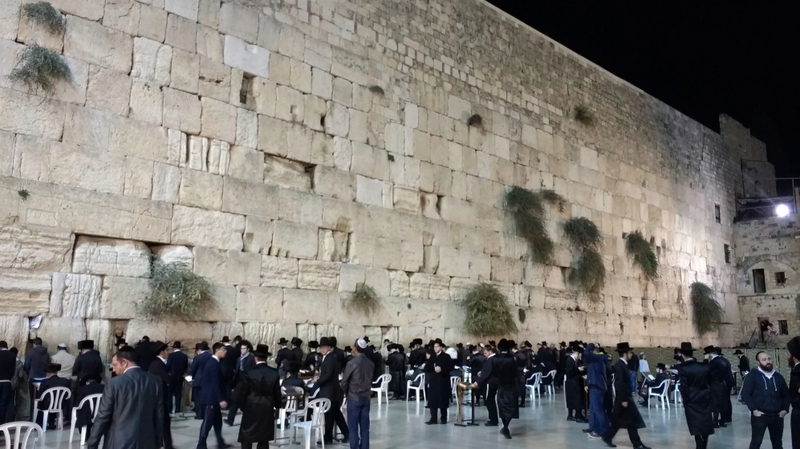 In Jerusalem, “Wailing Wall” at night. This was part of the retaining wall that supported the temple complex. Photo by Leon Mauldin. I’ve visited this very special location on numerous occasions, but this past November I had the occasion to take some night-time photos. Kidron Valley. Jerusalem/temple mount on left and in distance. Jesus crossed the Kidron going from Jerusalem to the Mt. of Olives. Photo by Leon Mauldin. It is possible that Jesus and His disciples rose up immediately at John 14:31, and that the continued discourse and prayer of chapters 15-17 occurred en route from the Upper Room on the way to Gethsemane. Others suggest that the short time required for Jesus’ teaching of chapters 15-16 and the prayer of chapter 17 can better fit within that Upper Room setting. That would not be unlike our saying, I [we] need to be going now, and yet a few more minutes of conversation take place before the actual departure. J.W. McGarvey observes, “Some think that Jesus then left the room, and that the next three chapters of John’s Gospel contain matters spoken on the way to Gethsemane. But it is likely that the words of these chapters were spoken in the upper room after they had risen from the table and prepared to depart, and that John 18:1 marks the leaving of the upper room as well as the crossing of the Kidron”(The Four-Fold Gospel.667). Nevertheless … arise, let us be going hence” ends the Passover feast. No destination is indicated, yet the disciples know that Jesus intends to meet “the world’s ruler” and thus once more do the Father’s ἐντολή. The asyndeton ἐγείρεσθε ἄγωμεν is idiomatic, as is also the combination of the present imperative with the hortative present subjunctive. The action of arising from the couches on which the company had dined is merely preliminary to the action of leaving the place and going elsewhere. Those who regard “Arise,” etc., as a separate sentence incline to the opinion that Jesus left the upper room at this point, spoke the next three chapters somewhere on the way to the Kidron, crossed this at 18:1, and then went on to Gethsemane. When we note that the bidding to arise and to leave is only the conclusion of a longer sentence, that 15:1, etc., indicates no change of place, and that ἐξῆλθεν in 18:1 reads as though Jesus did not leave the upper room until that moment, we are led to conclude that after the company arose from their couches they lingered in the upper room until Jesus finished speaking the next three chapters. This delay consumed only a short time. We cannot think that the next three chapters were spoken while the company was in motion, and John nowhere indicates that they halted at some spot along the way (Lenski, R. C. H. The Interpretation of St. John’s Gospel.1023–1024). a. In this very context Jesus clearly implies that there are still certain things which he wishes to say to the disciples (14:30). b. Speaking calmly and deliberately, without any attempt to rush himself, Jesus may have uttered the contents of chapters 15, 16, and 17 within a period of ten minutes! When a company has been together for several hours, what is ten minutes? . . . Accordingly, we shall proceed upon the assumption that the contents of chapters 14–17 comprise a unit, and that all of this was spoken that night in the Upper Room (Exposition of the Gospel According to John, Vol. 2.290–291). In 2012 I posted an aerial photo of the Kidron here. Ancient olive trees on the Mt. of Olives. 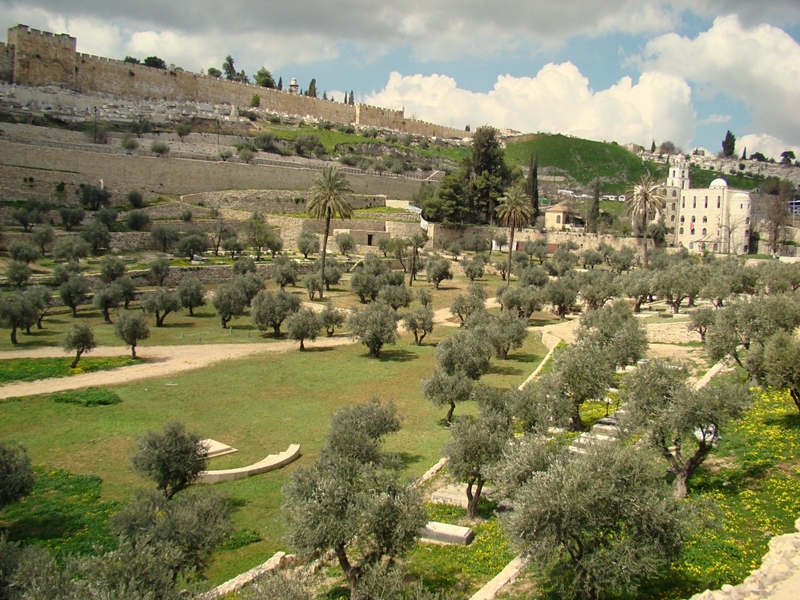 The Garden of Gethsemane was in this area. Photo by Leon Mauldin. 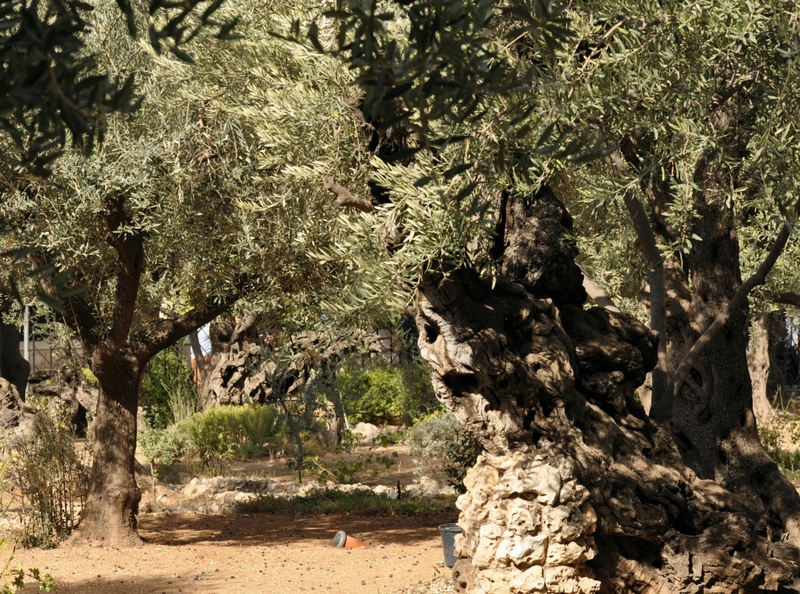 The meaning of Gethsemane is “olive press,” and therefore not a “garden” in the ordinary sense of the word, but rather an olive grove that contained an olive press. Though we cannot know the exact spot where Jesus went for prayer that awful night before His crucifixion, it would be situated on the Mount of Olives just east of Jerusalem and across the Kidron Valley. It would be here that Jesus went with His disciples (minus Judas; see John 13:30) to pray. “They came to a place named Gethsemane; and He said to His disciples, ‘Sit here until I have prayed. '” (Mark 14:32, NASB). We get somewhat of a glimpse of the horrible terror of that night as Luke writes, “And being in agony He was praying very fervently; and His sweat became like drops of blood, falling down upon the ground” (22:44, NASB). He submitted willingly to the Father’s will, because there was no other way that God could be both Just and our Justifier (Romans 3:21-26). So it was then at the site of Gethsemane that Jesus was betrayed by His disciple Judas, was arrested and from there led away to a series of trials before the Jews and the Romans, and then crucified. But then on the third day “was declared the Son of God with power by the resurrection from the dead, according to the Spirit of holiness, Jesus Christ our Lord” (Rom. 1:4, NASB). Hallelujah, What a Savior! You are currently browsing the Leon's Message Board blog archives for February, 2017.